Word on the street is that Teach For America (TFA) wants to publicly endorse Michelle Rhee (TFA alum) for US Secretary of Education. Apparently there is some pushback within the organization against the alliance of TFA, Rhee and Trump. The election of Donald Trump has positioned TFA, Education Post, the Democrats for Education Reform (DFERs), Black Alliance for Education Options (BAEO) and all of the other purportedly “civil rights” focused education reformers to get EVERYTHING they want— billions of dollars in privately-controlled school choice from the neoliberal president. Here are five reasons the education reformers LOVE the idea of Rhee and Trump. 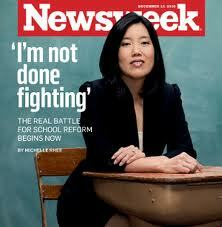 Michelle Rhee and education reformers are hostile to teachers’ right to organize. Trump’s presidency poses potential threat to labor unions. After creating conflict in DC for three years, Rhee went on to found Students First. Students First’s biggest publicity stunt was arguably their State Policy Report Card (SPRC). A look at the 2014 version clearly shows bias in their “methodology” against states that provide teacher input and say in education policy. For example, states were dinged in the report card if teacher evaluation was subject to collective bargaining. Her tenure at Students First was short lived when it was announced Michelle Rhee Will Leave CEO Job At StudentsFirst. 2. Donald Trump likes privately-controlled school choice. 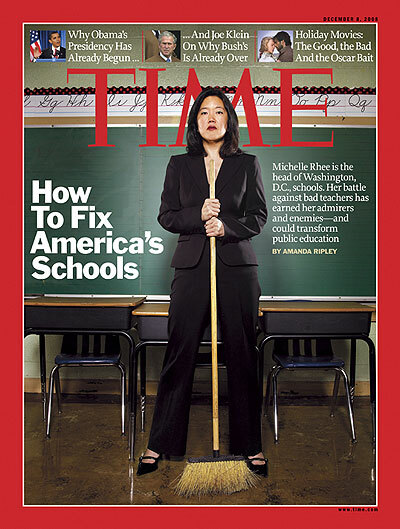 Michelle Rhee and the education reformers also LOVE privately-controlled school choice. In 2014, I had a debate/conversation after a @MichelleRhee tweet about her “tiredness” with the traditional school versus charter school debate. I tweeted that I was “totally tired too” of people “ignoring data” that traditional schools outperform charters. The debate also often ignores the access and equity issues that plague charters too. (See all of Cloaking Inequity’s posts on charters here) Debates on Twitter usually get lost in the annals of twitter history— so I turned to Storify to log the debate/conversation. What is Storify? It “helps making sense of what people post on social media.” Users curate voices and turn them into stories. Click the link below to follow the Storified conversation about charters versus traditional public schools with Michelle Rhee et al. It’s worth the click. Enjoy. 3. Trump and Rhee both live amongst scandal. You know, like a reality show. Rhee’s husband scandal has a strange twist related to school choice. I won’t mention all of the other alleged bad sexual behavior. But there was this concluding money quote in the Deadspin article that sounds strangely Trumpian. Have you every noticed that Trump is actually a verb, noun, and adverb? Read more at Charter schools reason for Mayor Kevin Johnson’s bad behavior? With the publication of Radical and a few years after founding StudentsFirst, a policy advocacy organization, former Washington, D.C. Chancellor of schools continues to push her reform agenda nationally, one that was severely burned when she exited the district after only three years in office. Well versed in being a celebrity, Rhee made the rounds of high profile media (e.g., Jon Stewart show) pushing her new book and the organization that she leads. So why should anyone kiss Rhee–“America’s most famous school reformer“– goodbye? Because she is a divisive figure and damaged goods as an educator. Both mean that her celebrity-hood as a school reformer–on the cover of Time magazine, chatting with Oprah and Jon–will give her visibility in 24/7 news cycle but not lead to any substantial elected or appointed political or educational office. No President will appoint her Secretary of Education; no governor will appoint her state superintendent of education and no school board will appoint her as their school chief. She is a polarizing, radioactive figure who will set off Geiger counters and create instant political turmoil and organizational instability–outcomes that may be good for media attention and garnering large speaker fees but disastrous for those responsible for making schools better and improving student performance. Could Cuban be absolutely wrong? How could Cuban have predicted that a president with a desire and preference for radioactivity would be elected? 5. Michelle Rhee has taped students mouth shut. Donald Trump would tape mouths shut (especially if you are in the cast of Hamilton) if he could because they “harass” him. Fortunately we have the US Constitution. Just saw her last night at Golden 1 with my ex-boss, her husband. Sac State and UC Davis the Cal and SDSU. They both spent the entire time on their phones. And Rhee had a sour look on her face all night- maybe she was reading your post! Not only do both Trump and Rhee enjoy living in the spotlight of scandal, they both exhibit a sociopathic need to play “god” and fire people. Peas in a pod.